Governments around the world are being criticized for spying & espionage, against each other and against their own citizenry. Reportedly, the Korean National Intelligence Service was enlisted by the right-wing government to manipulate public opinion & assure their candidate's election for President (and she subsequently "won"). A segment of the Intelligence Service's Psychological Operations Division was instructed to systematically post fraudulent political messages on bulletin boards and chat rooms, and to tweet positively about the favored candidate while trashing the opposition. All this was done secretly using online aliases and fake identities (which itself is illegal in Korea). A recent report (link) calculates more than 22 million Twitter messages may have been generated in this orchestrated spoof. (link in Korean & English) A New York Times article reports Korea's Cyberwarfare Command was part of the deception. (Cyberwarfare Command is part of Korea's Defense Ministry). What claimed to be public opinion was dishonest propaganda manufactured by the government to prolong the Saenuri Party term in power. The gradual unfolding of information and evidence over many months has been further troubled by cover-up efforts, press censorship, job transfers & creepy Watergate-like dirty tricks. 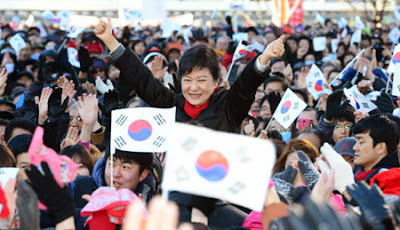 Korea's government has been more shaken by wider recent global notice of the scandal than by the fraud itself (link). Too many Koreans fear making any comment -- which itself is shameful for government. Any election misconduct seriously subverts democracy.